My mother always told me that shoes make or break an outfit. This was a rather traumatic realization for me, as I had stubbornly despised going shoe shopping from a young age and resisted my mother’s coaxing into this world that, according to the plots of rom-coms, all women were supposed to love. Shoes, chocolate, and wine — these are things that adult women are made of. I tend to spend more of my money on the latter two than I do on shoes, though I’ve grown to appreciate the pivotal role that shoes play in forming an outfit. 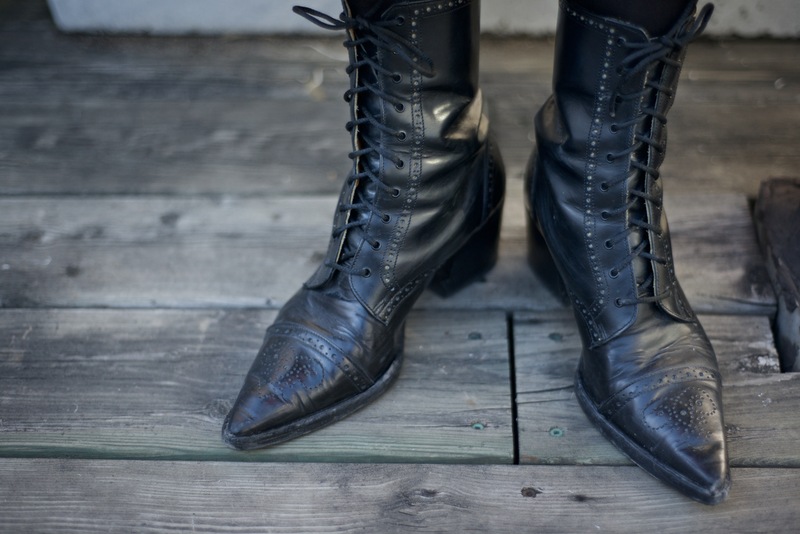 While I am not a fetishist, connoisseur, or avid collector of shoes, I do have a soft spot for a really interesting boot. 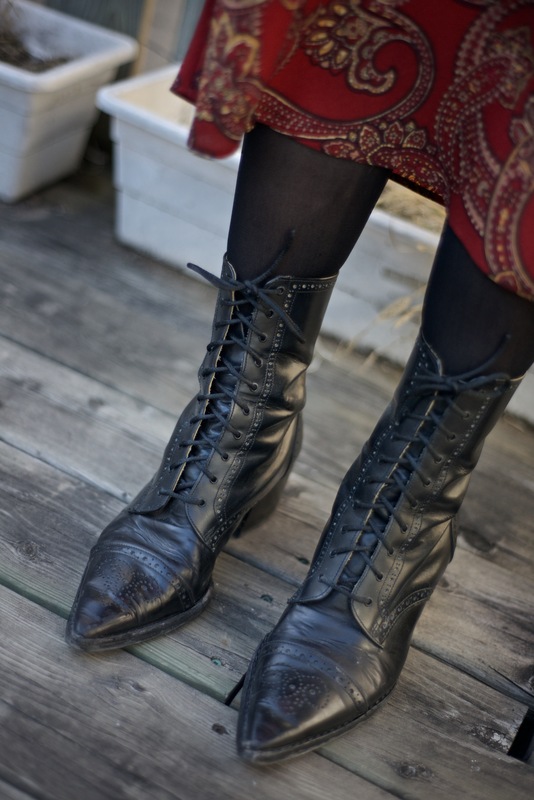 I found these Victorian-style lace-up heeled boots, which I lovingly call my “witch-ay boots,” at Chosen Vintage on Queen West in Toronto. The detailing on the leather is incredible. My favourite part of these boots is the dramatically pointed toe: wearing these makes me feel like I have supernatural powers. The “witchy boot” style works really well with 1990s-style dresses, both long and short. Here I am wearing mine with a long red paisley-patterned number from the nineties, recently gifted to me from my mother’s closet. It’s pretty great when you get to wear your mom’s hand-me-downs! The dress strikes that precious balance between loosely flowing and comfortably form-fitted: something I always look for in a dress. If you prefer wearing pants, witchy boots look great with a pair of high-waisted Levi’s jeans (for a vintage feel) or tight black pants (for a more contemporary feel). I suggest rolling up the bottoms of the jeans so that more of the boot can be seen. I’ve noticed that I’ve mentioned my mother a number of times in this post. Perhaps it is this perpetual mention of witches. I am lucky enough to be very close with my mother, but there are certain points that we disagree on. There are two things that I have to hide from my lovely Christian mother. 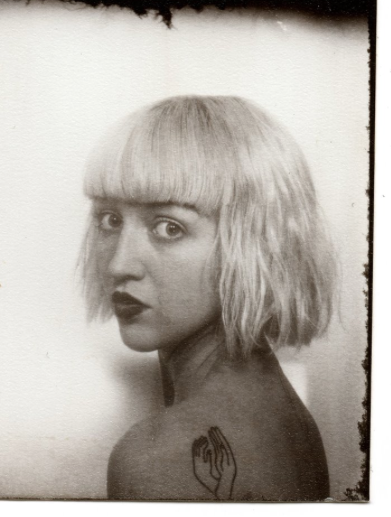 One is my fascination with witches and paganism, and the other is my stick-and-poke tattoos. Both of these things are taboo — especially in the context I was raised in. Stick and pokes have become quite the fashion trend. Indeed, I just came across an article that has been making its way around Facebook: the article states that, if 2014 was the year for septum piercings, then 2015 is the year of the handpoked tattoo. My friend Eva, a Vancouver-based artist and stick-and-poke tattooer, gave me three handpoked tattoos: a crescent moon on my thigh, a female sign on the inside of my finger, and two hands on my shoulder (seen here). Apparently I am not alone in my inherited shame complex, as Eva’s tumblr page can be found at “makeyrmomsad”. I suggest you browse through Eva’s whimsical tattoo art — she travels up and down the west coast, so perhaps she’ll be in your area soon! As a young woman and artist studying feminist theory and performance art, I am intrigued by the cultural weight that ‘witchery’ possesses (pun intended) in our society. In the worlds of both alternative and mainstream fashion, witchery is being taken up as a style — gothic pagan wave, for example, is my jam! In the awesome queer-feminist art circles that I frequent, witchery is being re-appropriated as a radical way of viewing ourselves in relation to nature, astrology, animals, and our bodies. I have found peace in my love of witchery. This Easter weekend I will be performing a femi-pagan piece with my friend Jen MacDonald entitled No Future Fertility Ritual at White House Studio Project in Kensington Market in Toronto. Come by and check it out if you’re in the area!